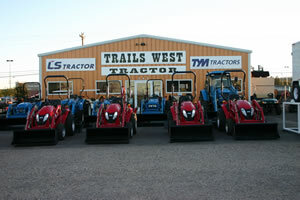 Welcome to Trails West Tractor, THE tractor dealer for LS and TYM tractors in all of Arizona and Western New Mexico. We have a premier line of farm and ranch tractors from 23 HP to 100 HP. We also carry a complete line of implements including backhoes, loaders, mowers, rakes, augers, box scrapers (gannons), straight blades, discs, tillers and post hole diggers, just to name a few. We have over 50 years experience in equipment sales. We offer the best farm and ranch equipment in the market today at very affordable prices. Plus we have attractive financing and leasing packages with easy terms on our entire line of LS and TYM Tractors. We are one of the few dealers that have a Service Department to maintain and service all the equipment we sell. If you are looking for a utility trailer or used golf cart, look no further. We carry utility trailers from 8' to 18' in stock, built by Playcraft. We also have over 50 used golf carts in stock, both electric and gas, 2-passenger, 4-passenger, as well as Workhorses. Please stop by and allow us to show you the only Tractor or Trailer you'll ever need at shockingly low prices. LS and TYM Tractors are all built solid, to take on any farm, ranch or construction job you have to do day after day and our Playcraft trailer line will meet all your transportation needs, large or small. We look forward to showing off these fine products. Trails West Tractors is THE place to go for tractors and trailers. Our Sales Office and Lot are located at 945 West 4th Street in Benson, Arizona, next to Wal-Mart, just a short drive east of Tucson, Arizona. Give us a call or send us an email. We'd be more than happy to provide you with information or a price quote on any of our product lines.